Osteria Mozza at Marina Bay Sands is going casual for lunch on weekends! The fine-dining restaurant by celebrity chefs Mario Batali, Nancy Silverton and Joseph Bastianich has always been known for good food, but sometimes seems a little too serious or forbidding compared to Mozza Pizzeria next door. Fortunately, the new weekend lunch is something you can bring the entire family for. 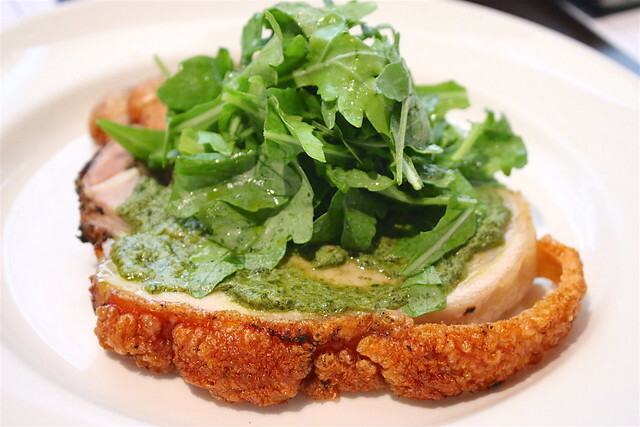 Osteria Mozza gets a more relaxed and casual ambience with the end of the work week. Gone are the starched white tablecloths, but the food is exquisite as ever. You can look forward to fresh salads, bruschette and Osteria Mozza’s signature mozzarella antipasti plates to start. They've also selected unique handcrafted pastas, Italian sandwiches and hearty main dishes. 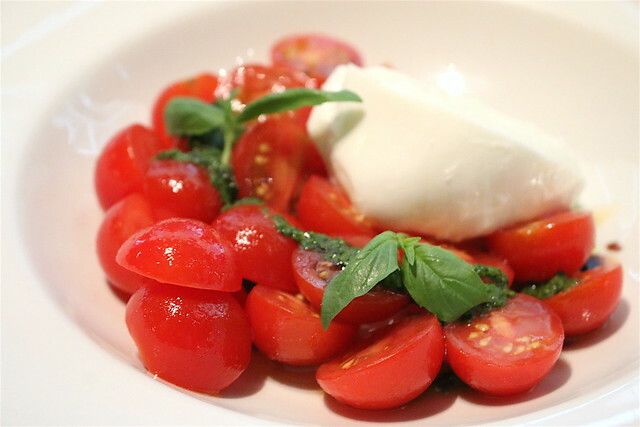 Go a la carte or craft your own three-course lunch menu (starter, pasta, dessert) for just S$48. “In Italy, the dining table sets the stage for family gatherings and celebrations. This was our inspiration for creating a more laidback feel for weekend lunch, where guests can enjoy the warmth and hospitality of a satisfying Italian meal with the family. We are also very proud to welcome into our Mozza family, new General Manager David Marazzi and Executive Chef Peter Birks,” says Mario Batali. David's here standing in the background overseeing the brisk and attentive service. This is a great salad to start with. 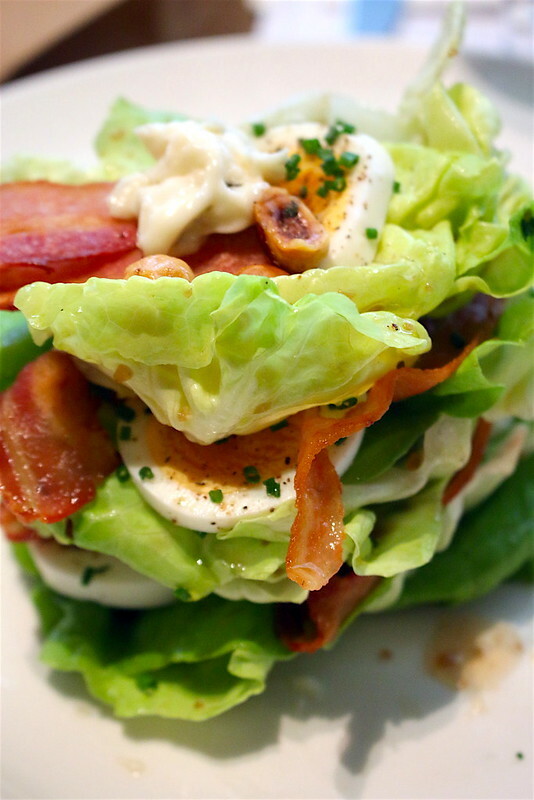 Butter lettuce is layered between toasted hazelnuts, streaks of crisp bacon, halved hard boiled eggs and Gorgonzola Dolce, all laced with an appetising vinaigrette dressing. The addition of Gorgonzola Dolce (also known as Dolce Latte) really makes this dish. This is a younger version of aged Gorgonzola, well-loved for its gentle, salty, spreadable texture. It's originates from Northern Italy. The salmon is cured in-house for 12 hours with a mixture of salt, sugar and dill. It is washed before being brushed with vodka. 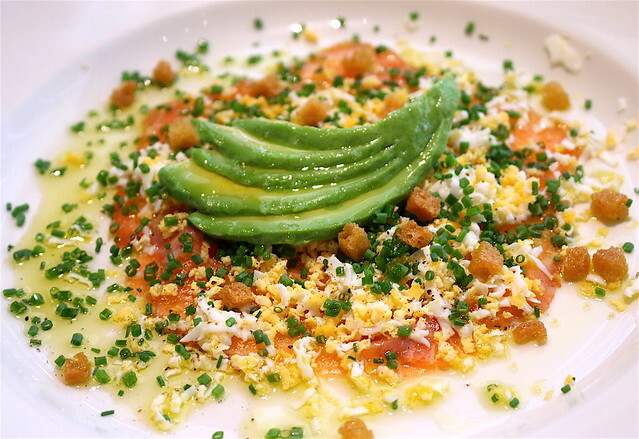 This whole dish is pretty intense in flavours with lemon zest, chives, croutons, shaved hard boiled eggs, avocado, sea salt and lemon olive oil. I actually thought it was quite nice eaten together with the butter lettuce salad too. Those sweet and juicy tomatoes are just amazing. 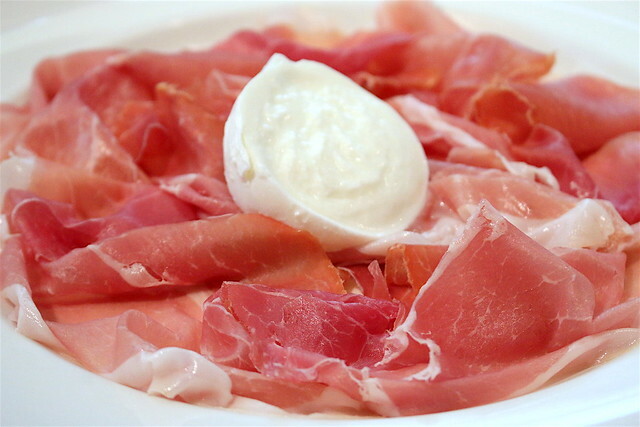 This is a generous platter of pillowy soft shaved prosciutto. Sometimes all you need are a couple of good ingredients that work together, and you have a dish to die for. This is such gorgeous presentation. 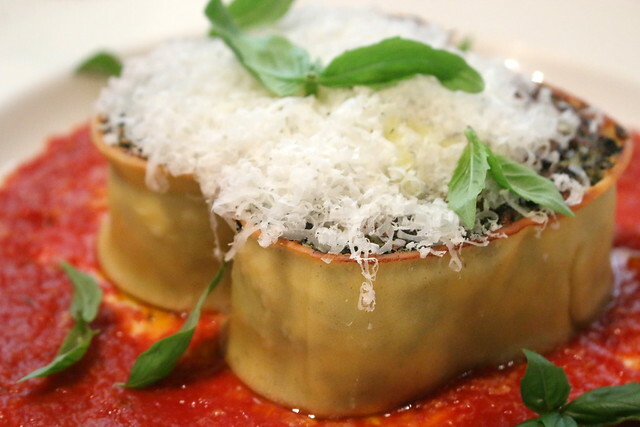 Two pasta sheets are covered with housemade ricotta, spinach, parmesan and pecorino before being rolled and tied. They are gently poached for 45 minutes before being cooled, portioned and placed into a pan to be seared on each side. They are then heated in the oven and served with a tomato sauce and grated parmesan on top. This is my favourite of the three pasta dishes; it's one of those things you just can't stop taking another scoop of. 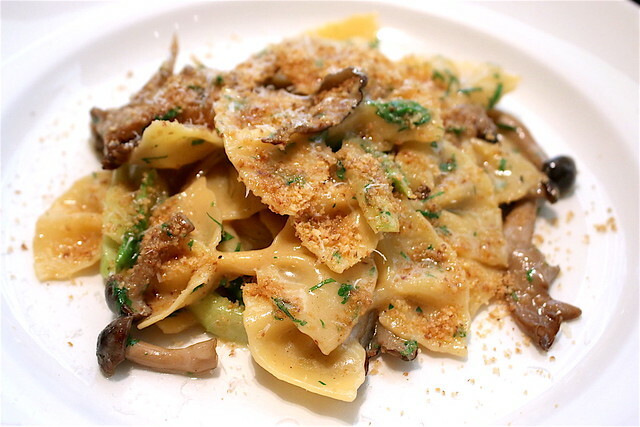 The farfalle is made in house and cooked perfectly al dente. It's tossed with a tantalising sauce of garlic, butter, asparagus, wild mushroom, thyme and parsley. Grated walnuts add some crunch. 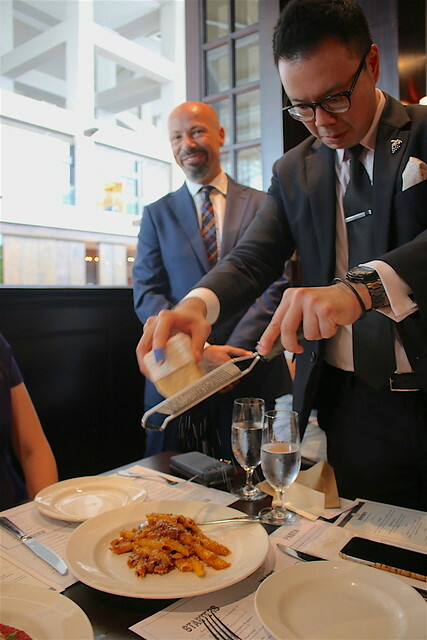 Parmesan is served tableside as the finishing touch. This was also excellent. Like the farfalle, the garganelli is freshly made in-house. I love this pasta shape; it picks up so much sauce, and yet remains wonderfully al dente despite its thinness. 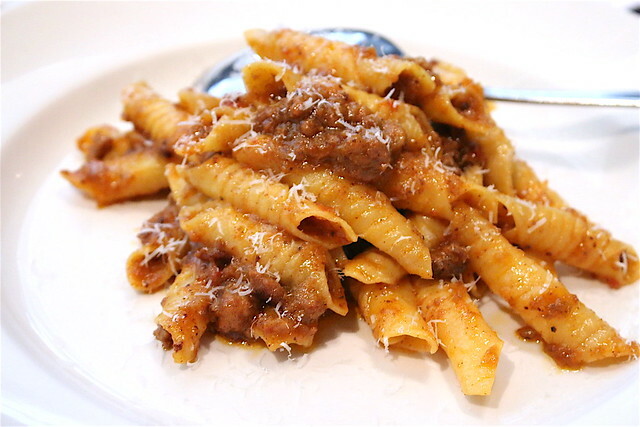 I'm normally not a fan of Ragu Bolognese but this version won me over. It's made with carrot, celery, onions, pork, veal, nutmeg, white wine, chicken stock, milk, tomato paste, pancetta and garlic - who could argue with all that? That crackling. Yes. They've got it perfectly crispy and brittle, instead of ridiculously chewy like some European roast pork tends to be. The deboned pork belly is seasoned with garlic, rosemary, sage and fennel pollen. It is then rolled and roasted. The meat was so tender I thought they might have sous vide'd the thing, but no. The salsa verde is a delicious sauce of garlic, parsley, oregano, capers, anchovy, extra virgin olive oil and Dijon mustard. Rosemary potatoes complete the ensemble. Hands down, my favourite main. I was surprised to see this as a main, but I suppose this breakfast-like dish can be a hearty one too because the eggs are scrambled with butter, cream cheese and heavy cream. 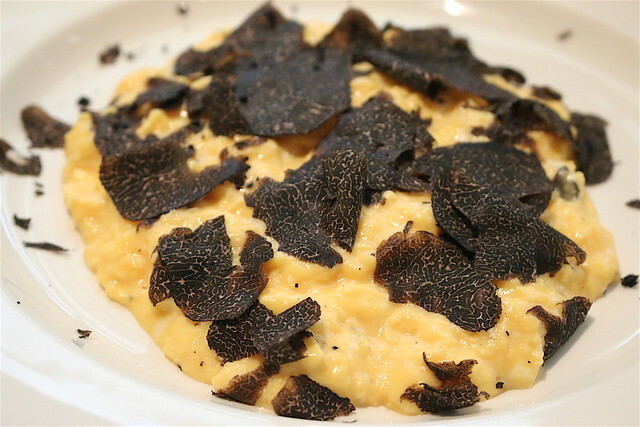 It's almost completely covered with shaved winter truffle. Truffle galore for truffle fans. 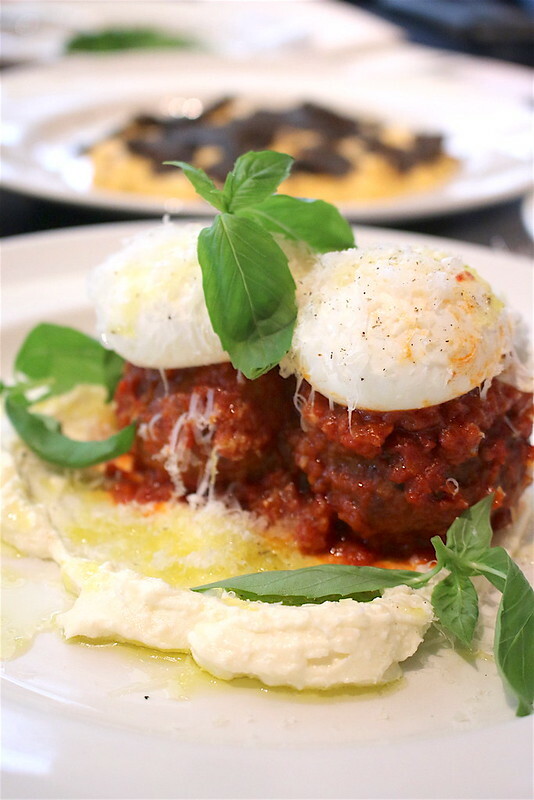 If you love Italian meatballs, this is the dish for you. The meatballs are made with minced pork shoulder, breadcrumbs, milk, garlic, onion, parsley, fennel seed, pecorino, salt and pepper. They are hand rolled, pan seared and baked before being served with a tomato sauce on a bed of house made ricotta. Finally they are topped with poached eggs, shaved parmesan, basil, and extra virgin olive oil. The name means ‘Grandma’s Pie’ in Italian. 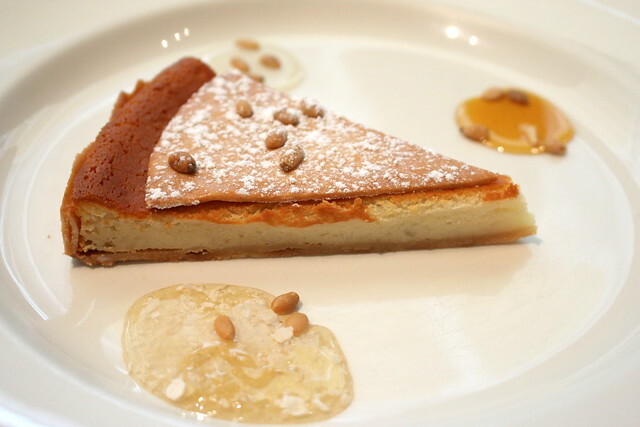 Osteria Mozza’s version is a tart baked with three kinds of cheese – mascarpone, cream cheese and goat's cheese. A crisp pine nut biscuit on top adds nutty crunch to the soft tart, and the three types of honey (honeycomb, chestnut honey and acacia honey) transform the tart with their different flavour profiles. In addition to ala carte and set menu options, Osteria Mozza also gets kid-friendly with a dedicated children’s menu, showcasing a selection of pastas, fresh juices and gelato at $29++ per child. Many thanks to Osteria Mozza for the Cucina Italiana experience!